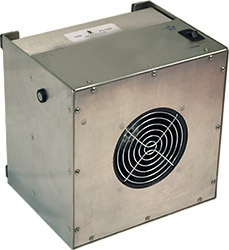 Apzem Soldering Fume Extractor's are designed to capture hazardous and harmful soldering fumes generated while soldering. 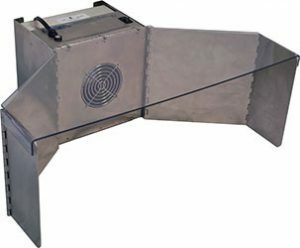 We offer tabletop solder fume extractor for single user to wall mounted, portable fume extractor with provision for multiuser as well. 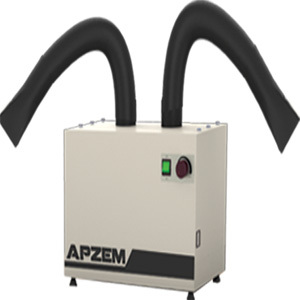 Apzem also designs and supplies centralized soldering fume extraction system connecting large number of soldering points to one centralized fume extractors. 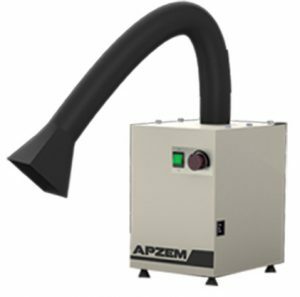 Apzem offers several different styles of source-capture fume extractors for solder fume control, solder pot and wave soldering fumes. Configurations include benchtop, wall-mounted, portable, and floor models. These compact and energy-efficient systems feature quiet operation, convenient mobility, and high efficiency filtration media including HEPA and/or Activated Carbon. ESD safe units are available for those concerned with electrostatic discharge while working with sensitive electronic equipment. 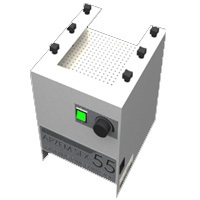 Modular design and sturdy construction make Apzem's Solder Fume Extractors a convenient and effective solution for solder fume control needs. Typical uses may include: solder pot fume control, solder smoke, lead-based solder fume removal and a variety of other soldering processes. Centralized Soldering fume extraction system for multiuser. Blast gate / Damper .